Born: 21 February 1858 and died 18 September 1945 at Linley Wood and is buried in Talke. Son of: Admiral Sir Leopold Heath KCB RN and Lady Mary Emma Heath (nee Marsh). 3. 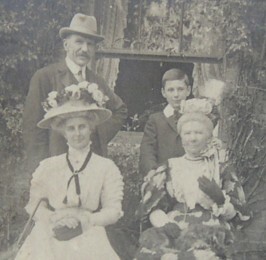 Cuthbert Eden Heath (1859-1939) who married Sarah Caroline Gore Gambier (1859-1944). 4. Ada Randolf Broadwood (nee Heath, 1860-1957) who married HJT Broadwood (1856-1911). 5. Admiral Sir Herbert Leopold Heath (1861-1954) who married Elizabeth Catherine Simson. Frederick married: Constance Mary Helsham Helsham-Jones, daughter of Col Henry Helsham Helsham-Jones, 23 January 1889. 1. Capt Cuthbert Helsham Heath-Caldwell DSC RN (1889-1979) who married Violet Charlotte Mary Palmer (1885-1972). 2. 2nd Lt Martin Frederick Heath-Caldwell RHA (1893-1915). 3. Note in the Royal Engineers Journal, Vol 14, July 1911. Frederick Crofton Heath, born at Mersham, near Southampton, Feb. 21st., 1858; went through the normal course until 1866, when he was sent to France, returning nine months afterwards, having nearly forgotten his own language, at any rate the spelling of it, for he failed to pass for the Royal Navy not very long afterwards, disqualifying in spelling. His first school was Brighton College, where he stayed several years, winning during that period the French prizes, the 100-yrd, race for those under 12 years of age, and several swimming prizes. 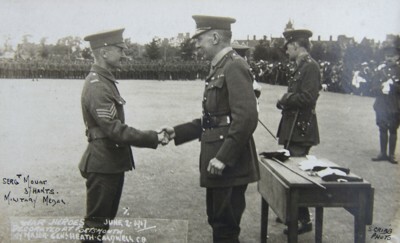 From Brighton College he was sent to Wimbledon school, to be prepared for the Royal Military Academy. Here it was discovered that he was "fleet of foot," which made him a useful half-back for the school football team. He succeeded in winning a prize for general improvement and good conduct, besides the school mathematical prize. 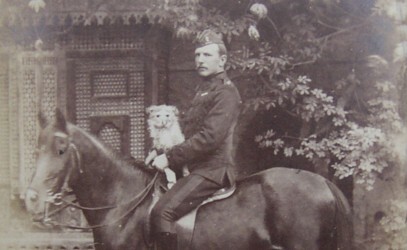 In 1874 he passed 21st in the examination for the Royal Military Academy. 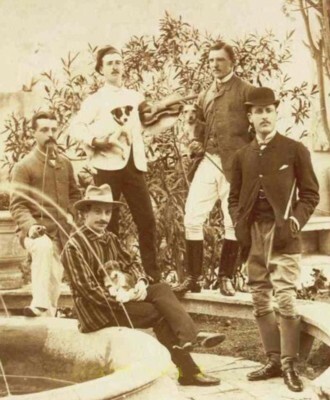 During his two-and-a-half years at Woolwich he was in the football team as half-back, and won whilst at the "Shop," a handicap hurdle race, and a jumping competition, when he cleared 5-ft. 2-in. He passed out of the Academy second, thus obtaining a commission in the Royal Engineers. In Jan., 1877, he joined the School of Military Engineering at Chatham; after completing the two years course, he was employed making roads on Hounslow Heath with working parties of several hundred militia men, who were out for their annual training, he then went through a course of ballooning, and in 1880 left England with the 17 Company for Malta. There he played a little polo, and took part in the usual garrison life. In 1882 one morning at 6 a.m. a telegram was received from the War Office, ordering the 60, 38, Infantry Battalion, and the 17 Company R.E. to embark forthwith on H.M.S. Agincourt and H.M.S. Northumberland: the evening all were on board and the ships left under sealed orders; a few days later the bombardment of Alexandria took place, and two days after this the 17 Company, in which he was senior Lieutenant, landed at Alexandria; thus he was one of the first to land for the 1882 campaign; he went with the main force, took part in the battle of Tel-el-Kebir, and was with the first troop to enter Cairo. In the autumn of 1884, he went with his company to Suakim to prepare for the landing of a force for the relief of Gordon. Here he stayed for twelve months, and took part in the 1885 Suakim expedition. For the work prior to the expedition he received the thanks of the Commander-in-Chief, H.R.H. the Duke of Cambridge; for the 1882 and 1885 expeditions he received the Khedive star and the Egyptian medal and two clasps, and was mentioned in Lord Wolseley's despatch, and was promised a Brevat Majority on reaching the rank of Captain. On his return to England in the autumn of 1885, he accepted the position of companion to one of Lord Salisbury's sons for a year to travel with him in Germany; it was during this period that he was introduced to, and spoke, to the Emperor William, the Empress Augusta, the Crown Prince Frederick, afterwards the Emperor, and his son William, the present Kaiser, to whom he and his wife were introduced later on in 1904, when H.I.M. expressed a wish in saying "Good-bye," that his eldest son should become High Admiral, and his second son Inspector General of Engineers. During his stay in Germany he worked for the Staff College; on his return to England he was quartered at Aldershot, and became engaged to Constance, only child of Col. Helsham-Jones, then the Officer commanding troops and companies R.E. at Aldershot. The engagement was a long one, and their marriage did not take place till Jan. 23rd, 1889 after he had completed his two years' course at Staff College, and obtained his P.S.C. Whilst there, in addition to his ordinary duties, he was Hon. Secretary to the Staff College Drag hunt. After this, he was sent to South Africa at short notice on secret service, three months before the outbreak of the war. During the campaign he held the appointment of Staff Officer to the G.O.C. Lines of Communication, Commandant Hoopstedt; Staff Officer to the G.O.C. Griqualand West Expedition; A.A.G. to the G.O.C. Midland District; and finished up in command of a column of some 700 mounted men, which he held for six months, and gave up three weeks before the termination of the war. For his services in South Africa he was mentioned in Lord Roberts' despatches, and promoted Brevet Lt-Colonel. On returning home he was stationed for a short time at Colchester, and then went to Gibraltar for two years as C.R.E. South. In 1904, he was ordered home to take up the appointment of C.R.E. London District, and then Asst. Adjt.-Gen at the War Office. This post he held until Oct. 1908, when he was appointed Inspector of Royal Engineers, with temporary rank of Brigadier General. In 1909 he was made a Companion of the Bath. Frederick succeeded in May, 1913, to a property known as Linley Wood, Talk-'o-th'-Hill, Staffs., descending to him from his great-uncle James Stamford Caldwell. On succeeding, he took under the will the name of Caldwell, as his principal name. Just prior to the outbreak of the war, I was promoted Major-General, and was commanding the Scottish Coast Defences. In the midst of mobilising and providing for the large influx of troops I received sudden orders to go to the War Office, to take up the appointment of Director of Military Training, which I held until the appointment was abolished in January, 1916. 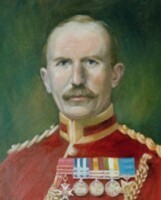 The duties of Director of Military Training were very heavy; they involved the organisation of the training, and the distribution of the training personnel and material for the Kitchener Armies which were being raised, the organisation of schools, such as Artillery, Machine Gun, Musketry, Bombing, and numbers of other schools, the training of re-inforcements, and training of officers. During the twelve months, no less than 45,000 young officers were collected by my department, and provision made for their training. From March, 1916, I took over the command of the Portsmouth Garrison, which at that time had a strength of some 36,000 officers and men. I was personally complimented on the efficiency of the garrison by Lord French, who said he would bring the fact to the notice of the Secretary of State. I was mentioned in W.O. despatches for good work. In April, 1918, I was offered and accepted the command of a Royal Air Force Area, containing some 70,000 officers and men. The Command was a new one, and I had to organise from start to finish. I began with two staff officers, and ended with some 50, the head quarters being at Covent Garden Hotel. I gave up this Command in February, 1919, receiving the thanks of the Secretary of State, Air Force, for the valuable work done. I retired on February 22nd, 1919, having completed 42 years service in the Army. Mrs Heath-Caldwell did her share of war work, especially at Portsmouth. (End of note in Records of the Heath Family Vol 2). Another event in Frederick's life, not mentioned in the family record, is that he played in the Royal Engineers Amateur Football Club that was composed chiefly of officers and in the 1870s competed for the FA Cup (then all amateur). He appeared as half-back in the team that played the 1878 Cup Final at Kennington Oval, which lost 1-3 to the Wanderers (a position that mirrored their contest of the first Cup Final in 1872). En route to the 1878 Final the Engineers had beaten East End club Pilgrims 6-0, Welsh club Druids 8-0, Oxford University 4-2 after two replays, and Old Harrovians 2-1, but it would be their last appearance at that level. He is one of the subjects of the book 'The Early FA Cup Finals and The Southern Amateurs: a Who's Who and Match Facts 1872 to 1883' by Keith Warsop (2004). In 1913, Frederick's last remaining aunt Elisa Lousia Marsh-Caldwell died, and Frederick took possesion of the Linley Wood Estate under the conditions of his uncle's will (James Stamford Caldwell). James had actually died 55 years earlier in 1858 and had left his entire estate to Frederick who at the time was only a baby. In meeting the terms of the will Frederick took on the name Caldwell in addition to his father's name of Heath. During World War I Frederick was the Director of Military Training, followed by being the Commander of the Portsmouth Garrison and in his last few years he was involved in the setting up of what was to become the Royal Air Force. For many, World War I was a particularly sad time, as it was also for Frederick and Constance when in 1915 their younger son Martin was killed in action, at the age of 22. 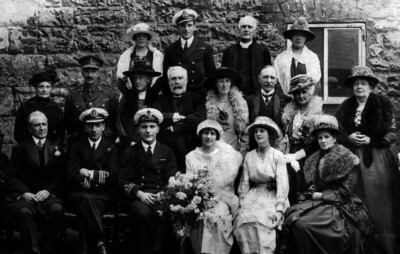 On 5th May 1919 Frederick's son Cuthbert married Violet Palmer daughter of Surgeon J.M.Palmer of Armagh. 1919 was also the year of Frederick's retirement from the Army. In 1924 Frederick was made a JP for Cheshire which, together with his duties running the Linley Wood Estate, presumably kept him quite busy. 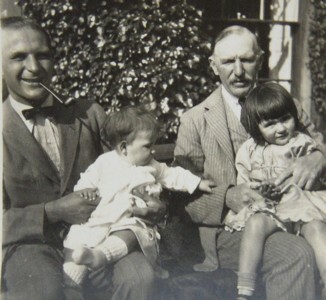 In the 1930s Frederick and Constance looked after some of their grandchildren for a few years while his son Cuthbert was away in Hongkong. I understand that Frederick passed away very peacefully at Linley Wood on 18 September 1945, during an afternoon nap. He is buried at St.Martin's Talke O'Th'Hill, together with his wife Constance who died in 1957. For more information on the setting up of the RAF please go to: 'Air of Authority - A History of RAF Organisation' www.rafweb.org . For more information on the history of Portsmouth please go to: 'History in Portsmouth' www.history.inportsmouth.co.uk .